Tracy's Notebook of Style: Target Store Clearance Finds: 50-70% off Home Decor!!!! See 30+ Pics with prices! Whoa! I still can't believe this bar cart is only $38.98!!! This is a really nice side table, very good quality, this style is trending huge right now! Such a cute trendy style, similar to ones you'll see at Anthropologie for $60 or more! so I'm not sure if that was on clearance, honestly have never seen it before today. Another bedding steal for only $29.98! The prettiest bed set for only $34.98, perfect for college students or a guest bedroom. Even though signs read 30% off, everything was 50% off! This set includes two tables for only $29.98! I didn't get how these were priced this high in the first place! 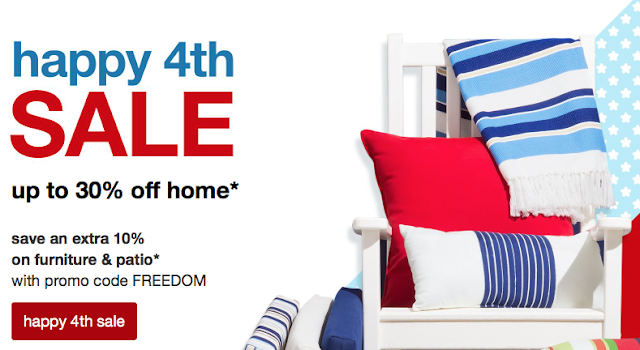 but I've been seeing other people posting 70% off outdoor furniture at some locations. As you can see, this location is fully stocked, I'm hoping to find them for 70% off later this week. Love these to give as a housewarming or wedding gift. Lots of Pillowfort for kids clearance too, you could easily use these as an "adult" lol. I'm sure this will be marked down even lower this Thursday! Can't beat the price of a large mirror under $25! Love these! I got one to use in my entryway for misc. items I haven't put away yet or magazines. Couldn't get over how many storage baskets were on the shelves! Just a week ago, they only had about six and they were regular price, guess they restocked. My store has sooo many of these, seriously I saw at least 30! I own the one on the left and it is amazing and only takes a few minutes if you use it regularly. Starbucks is offering a Buy One, Get One FREE on all grande espresso drinks thru July 2! Your are posting Great articles and also blog pics are awesome to see. I appreciate your hard work. trending in dresses Thanks. It is critical for professional water damage restoration techs to start work immediately, every minute can make the difference on whether we can save your beautiful hardwood floors or if they need to be ripped out and replaced.